We are unconditionally in love with our Mac, howsoever old it might be. 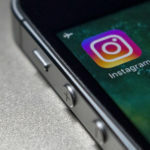 While Apple do has a tendency to back its computers and devices for a considerably long period; the release of macOS Mojave declared it otherwise as most Macs won’t be able to install the new operating system. Basically, any Mac which is older than 2012 renders to be incompatible with the new operating system. So, if your Mac happens to be on the unsupported list, it is, indeed, disheartening and saddening. 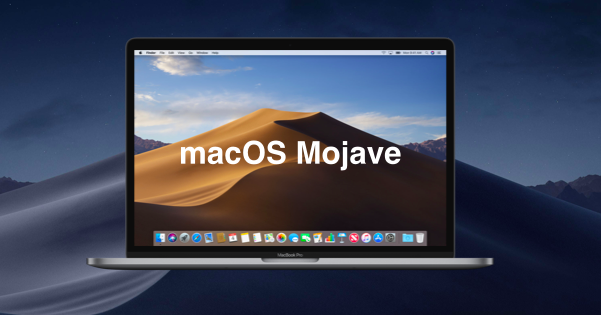 However, if you seriously wish to install macOS Mojave on your incompatible Mac, you can do it with the aid and assistance of macOS Mojave Patcher. Now, you can sideload iOS Apps on Windows/MAC with the help of Cydia Impactor. Check our guide to know how. Speaking about macOS Mojave Patcher, it is a software tool that allows you to run the latest macOS Mojave on your unsupported Mac. Credits for developing this application goes to a developer who goes by the name Dosdude. The tool creates a bootable image file of the latest macOS by accessing the same directly from Apple Servers and hence, a flash drive can be utilized to go ahead with the installation on unsupported devices. Please note that Apple has got reasons for not including the old Mac of yours onto the officially supported list. This is because of macOS 10.14 Mojave faces issues with pre-Metal Intel and AMD GPUs. Furthermore, it relies heavily on the Metal framework which, you might be knowing, is available only in the Mac models of 2012 and later. Moreover, you might face issues in your older Mac related to WiFi setup post installing macOS Mojave on the same. Following is the list of devices that are compatible with macOS Mojave Patcher tool and allow it to do its work. Love streaming online videos? Good news for you! Kodi 18 Alpha 2 has been released for iOS & Mac. Check it out. As a first, you must perform a Time Machine Backup on your Mac. Please note that you must not skip this step as the installation of macOS Mojave could fail depending on the specs of your device. Following are the things that you will require for this process. A USB drive with 8-16 GB of storage. Next, please check the WiFi card type of your Mac by navigating to Mac-> System Report -> WiFi -> Card Type. Following are the Ids that won’t work with the latest macOS Mojave. Please have note of your Mac model as well. You can check the same from Mac -> System Report -> Model Identifier. Updates: tvOS 12.1, iOS 12.1 & WatchOS 5.1 Released Finally (Performance Improved). First, put in a USB drive and format it as macOS Extended (Journaled). Next, launch the macOS Mojave Patcher tool and browse for macOS Mojave Installer application. 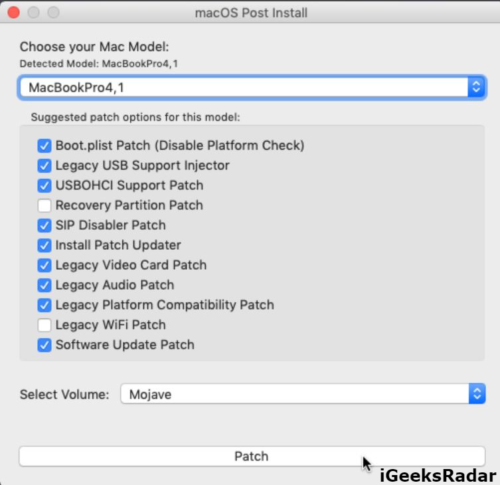 Post selecting the macOS Mojave Installer application, the Patcher tool will successfully verify the application. This might take a little time so please be patient. Once the operation is done you require booting up your Mac off the USB drive. For this press and hold the Alt/Option key when your Mac is turning on, before you hear the Mac startup chime and select your USB drive from the menu that comes up. macOS Installer will come up now. Open Disk Utility by selecting the same from the Utilities menu and select the partition where you want to install macOS and erase the same. Make sure the format of the partition is Mac OS Extended (Journaled). Alternatively, you can install macOS directly on your main partition to upgrade completely. 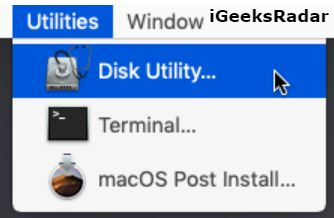 Post completion of the installation, please boot off the USB again and this time, from the Utilities menu option select ‘macOS Post Install’ and in this application please select your Mac Model (which you noted down earlier) and the partition on which you installed Mojave. Cool! macOS Mojave should be up and running on your device now. Also check: Download tvOS 12.1 Beta Without Developer Account. 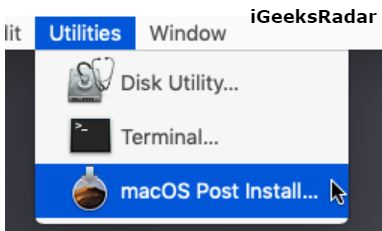 Mojave installer will have an application named as ‘Patch Updater’ in the Application/ Utility folder if the same was selected in the macOS post install tool. This tells you whenever new patches are available for your Mac. 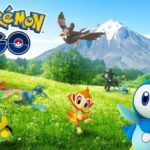 If you don’t have the Patch Updater tool but wish to install, you can get the script for the same from here. Patch Updater tool also helps you to reinstall the patches that might have got overwritten during the process of system updates. 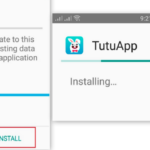 You can select ‘View Installed Updates’ from the tool and simply right click and select Re-Install to reinstall a patch. Please note that System Updates will work fine if ‘Software Update Patch’ was selected in the macOS Post Install tool. If you don’t get system updates or the same are not working correctly; you can utilize Patch Updater tool to reinstall the Software Update Patch. If the machine does not start up properly after applying a system update, you require to boot off your patched installer volume and rerun the post-install patch on the partition where you installed Mojave. You require selecting “Force Cache Rebuild” prior to rebooting. So, these were the steps to install macOS Mojave on your unsupported or incompatible Mac. If you happen to face any kind of issue during the process or have any additional question to ask, please utilize the comments section below to let us know about the same. Parallel Space Multi Accounts App on iOS(iPhone/iPad) Without Jailbreak. 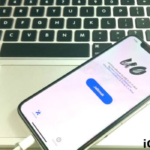 iOS 12 Untethered Jailbreak Demoed By Security Researchers.